Most of us can agree that injuries aren’t a desirable outcome from our training or any physical activity we might engage in. Yet when you ask the average coach, “What can I do to prevent injury?”, you’ll usually get a generic answer along the lines of “make sure you warm-up and do some stretching…”. While sound advice, this doesn’t provide an individual with a practical framework to approach injury prevention. 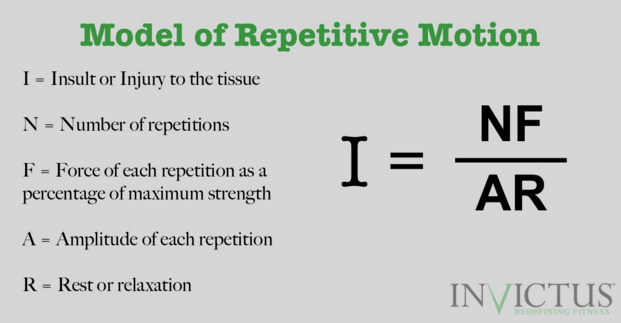 The goal of today’s post is to introduce the “model of repetitive motion” to help provide a framework for both coaches and athletes to systematically approach injury prevention in their training. Dr. P. Michael Leahy, founder of the popular manual therapy modality known as Active Release Technique (ART), is credited with developing the model of repetitive motion. While most people often think of injuries as something acute, such as a broken bone or ankle sprain, repetitive trauma can also have a cumulative effect that results in injury. Because CrossFit is a non-contact sport that involves a high number of similar movement patterns, it’s reasonable to assume that athletes in the sport are more likely to experience injury due to repetitive motion instead of a blunt force trauma. Most can agree that anyone who exercises will cause a degree of insult to their muscle tissues from training. This is necessary and a part of adaptation to a training stimulus; however, we want to manage the threshold to minimize our risk of causing injury. In our competitive athletes, we’re always playing tug-of-war on both sides of the equation. 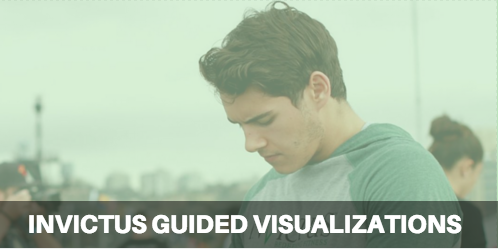 We can play with the variables on the other side of the equation to keep them below threshold in order to better their odds at staying healthy throughout the competitive season. Insult can be thought of as soft tissue restrictions that result from physical activity, which can include poor postural habits in addition to training in the gym or playing a sport. Injury can be viewed as harm or damage to a structure. In either case, the degree of insult or injury is dependent on the other variables covered below. This is pretty self-explanatory and simply refers to the number of repetitions imposed on the tissues. Typically, we can think of this as reps of a given exercise but performing other repetitive motions like running long distances or typing on a keyboard throughout the day can also be considered “repetitions” in this model. Also, sitting in a poor position or holding an awkward posture for extended periods of time can be considered a high number of repetitions since certain muscles are active for long periods to maintain the position. For example, an office worker sitting at a desk all day with their back slouched and head forward or a military operator or law enforcement officer who might be sitting in a vehicle for extended periods of time while wearing their respective equipment would all be considered high N values due to the extended periods of poor posture. This variable isn’t defined as the total force generated in a movement but rather is a percentage of maximal strength. For example, if two athletes are lifting the same load, F will be higher in the weaker athlete compared to the stronger athlete. Because the weaker athlete has a lower one-rep max, the load is a higher percentage of their maximum strength and therefore results in a higher F value. Conversely, a stronger athlete will be able to move the same load as a weaker athlete for a higher number of repetitions before reaching threshold. This is also important to understand on an individual basis as weaker muscle groups will have a higher F value. This is all the more reason to be strong in absolute terms as well as use corrective exercise and accessory work to address strength imbalances in all planes of motion. Don’t worry about graphing sine waves here. In this context, amplitude refers to the range of motion. Simply put, more range of motion is considered to be a larger amplitude. Therefore, adequate range of motion is preferable as it can reduce the insult to the affected tissues. One caveat to range of motion is hypermobility. This is probably best discussed in another post but it’s important to understand that the price of excessive mobility is reduced stability which can also lead to injury. It’s important to be aware that there is a point of diminishing returns with excessive mobility but the key point here is that athletes should have adequate range with respect to the movements they intend on performing. This typically refers to the rest between training sessions that will use the same muscle group rather than the rest between sets or exercises. For example, a CrossFit athlete who does squats everyday will have a much lower R value compared to a lifter who squats once or twice a week. The R value can be managed by reducing the frequency of training sessions or adjusting the program design so that the affected muscle has more rest compared to other areas of the body. Based on the model of repetitive motion, we can see that the recipe for creating injury is to have an athlete perform a high-volume (increased N) training program that primarily uses high percentages of their maxes (increased F) with minimal rest days (decreased R) and neglecting to address poor range of motion (low or decreasing A). Therefore, in order to reduce insult and injury, we should aim to increase range of motion (A) and rest (R) when appropriate, as well as decrease training volume (N) and increase strength and address strength asymmetries to decrease F.
If an athlete has an injury-prone area of the body, generally we can start by evaluating for adequate range of motion. For example, for overhead movements like push-press, jerks, pull-ups, and handstands, you should establish if you have a true overhead position instead of a poor compensatory position that’s created by anteriorly tilting your pelvis and excessively extending your spine. However, if you already have enough range, you might want to consider increasing your rest between training sessions. I am aware this is can be difficult for many athletes to do, but unless your ability to pay your bills and feed yourself in the short-term depends on your athletic performance, allowing an injured or problematic area to rest is certainly a wise choice if your goal is to make a full recovery and/or reduce risk of injury. Decreasing N can be achieved in a few ways. If we are addressing a postural issue, sitting or standing with a better position can reduce N. In the case of training in the gym, a simple method would be to reduce the number of repetitions you are performing. You can scale down the reps in a workout or reduce the number of sets to achieve a lower N value. Decreasing F can be achieved by reducing the load lifted and/or strengthening the weak muscle group. This may seem contradictory at first but bear with me for a moment. Let’s say an athlete with a problematic rotator cuff insists on performing a conditioning workout with high-repetitions of an overhead movement. In this case, it might be wise to reduce the load lifted during training (since F is a percentage of maximal strength) and then add accessory work that addresses the specific strength issues of the rotator cuff (decreasing F by increasing maximal strength). Or in the case of a strength training scenario, the athlete may reduce the number of repetitions (decrease N) and keep the same load (same F), reduce the load (decrease F) and maintain the number of repetitions (same N), or some combination of reducing both (decrease N and F). Whether you are a recreational or competitive athlete, the model of repetitive motion shows us the importance of creating adequate range of motion through modalities such as self-myofascial release (foam rolling, lacrosse ball work, etc. ), manual therapy (massage, ART, Graston, etc. ), and stretching. A key point here for trainers and athletes is to understand that chronic, high-volume training can carry a higher risk for causing injury compared to low-volume, heavy training. Also, another important takeaway is to understand the role of having a solid strength base, addressing muscular imbalances, as well as intelligently managing rest days in preventing injury. 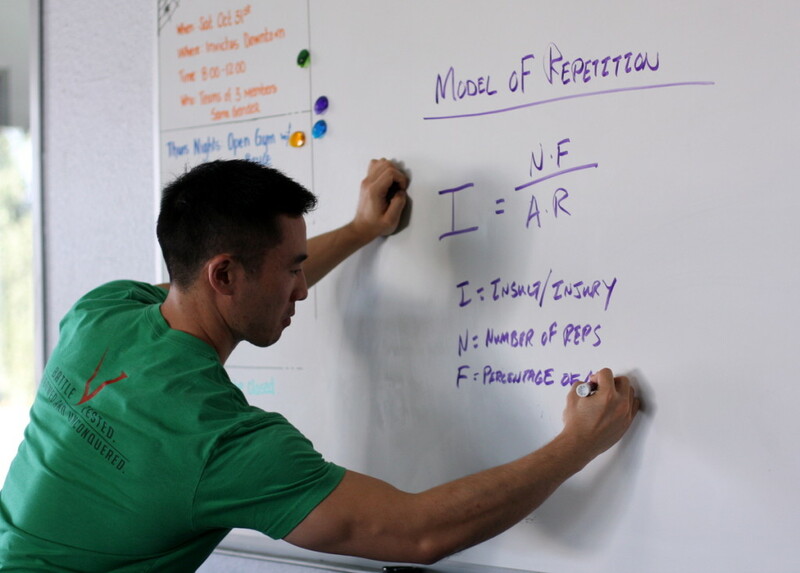 For most of my clients, my coaching process involves starting with assessing their range of motion, prescribing mobility and flexibility exercises based on their current range of motion, referring out to manual therapists as needed, prioritizing strength development in their initial training phases, as well as addressing individual strength asymmetries. 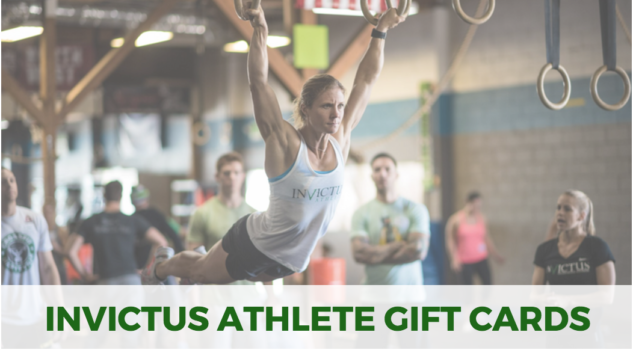 Depending on their goals, I will progress a client onto a higher-volume training cycle, a skill development focused training phase, or participate in a CrossFit training program where rest will be minimal and strength imbalances won’t be actively addressed. Let me know in the comments or on social media if you would like me to go into more depth and detail on my coaching process in a future post. Still confused about how this all applies to training and injury prevention? Feel free to post a question or ask us on Twitter (@CFInvictus and @_CalvinSun).